The cryptocurrency market most especially bitcoin has noticed a huge increase in the number of investors within the last few months. Many web developers this days even go as far as embedding cryptocurrency miners in websites and this mines crypto coins on desktops and smartphones without the owners consent. About 3 weeks ago, Opera added cryptocurrency miner protection in its desktop-based browser which prevents miners from mining cryptocurrency with the browser, now the company announced that the feature is now available for Opera Mini, Opera for Android and iOS. "The new anti-cryptocurrency mining feature is activated by default when enabling the ad blocker on Opera Mini and Opera for Android. The ad blocker can be enabled in 'Settings,' and it will automatically detect and stop the mining scripts written into the coding of a webpage." 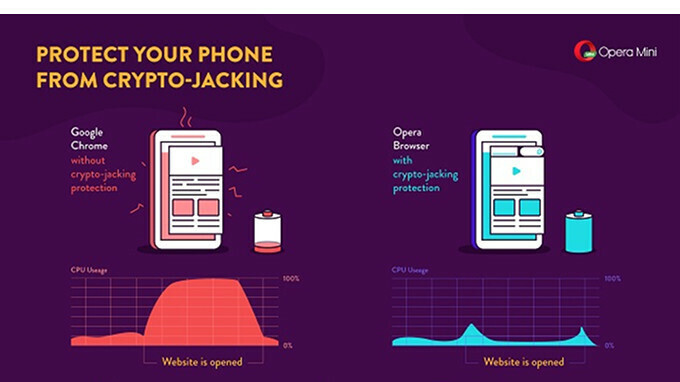 According to opera's estimation, more than a billion devices worldwide are slowed down by website-based cryptocurrency miners that users do not realize are "cryptojacking" their browsers. On the other side of the browsing experience, the company believes there are now more than 3 million websites with embedded cryptocurrency miners. There are most times no visual cue that a miner is taking advantage of a web browser so it makes it almost impossible for users to know. Cryptocurrency miners can overload smartphones' CPUs, forcing 100 percent usage and potentially causing a phone to overheat and may lead to permanent battery damage. Opera's new feature is already available for both Android and iOS users, you can download the browser from the Google Play store for android users and app store for iOS users.